You would think that one of the most iconic movie villains would be somewhere scaring children or plotting ways to take over the universe, but since the president has both of those on lock, Darthvader can go back to his regular life, living in Tennessee and working a regular job, just like the rest of us. 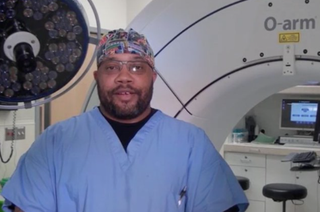 That’s right: Darthvader Williamson, 39, is a surgical assistant at St. Francis Hospital-Bartlett in Memphis. Carrying a name like “Darth Vader,” which Williamson spells as one word, can be tough for a teen, but when ladies love it, you kind of have to embrace. “He wanted to change his name when he was little, but after the girls started telling him they liked the name, he wanted to keep it,” Williamson’s mom, Patricia Knowles, 64, told the news station with a laugh. Williamson can blame the name on his dad, who was a huge Star Wars fan. Williamson’s mom admits that she’d never seen the movie and didn’t know that Vader was “originally a Jedi prophesied to bring balance to the Force,” who eventually falls prey to the dark side and serves the evil Galactic Empire. But Knowles kept her promise, and Darthvader Williamson was born Jan. 14, 1978, a few months after the movie debuted in 1977. The funniest part of this whole story is that Darthvader isn’t really a fan of the Star Wars series. Knowles, who has since familiarized herself with the dark movie villain, sees similarities between the two.